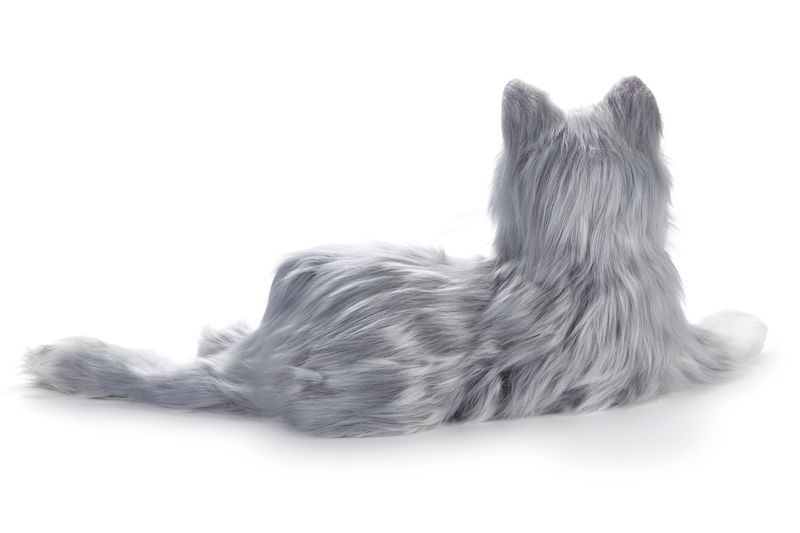 The Joy for All Silver Companion Cat is a beautiful, soft cat that looks, feels and sounds like a real cat. 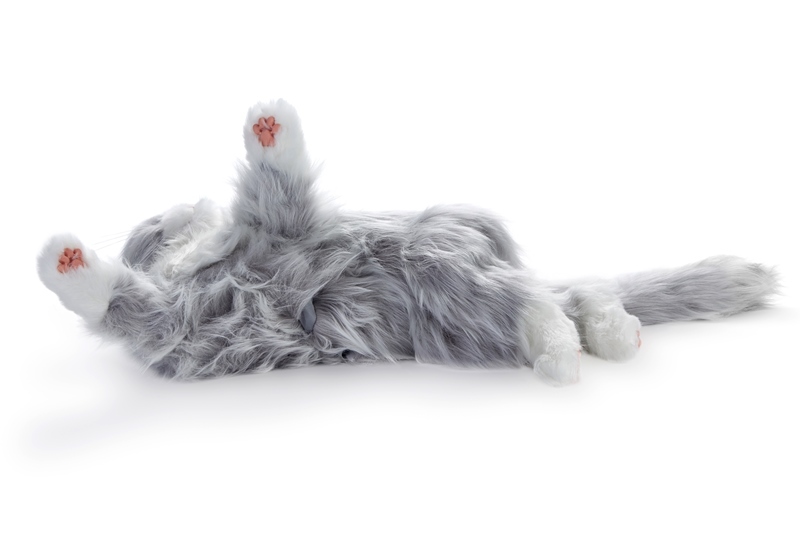 This adapted pet cat is designed to respond appropriately to motion and touch. 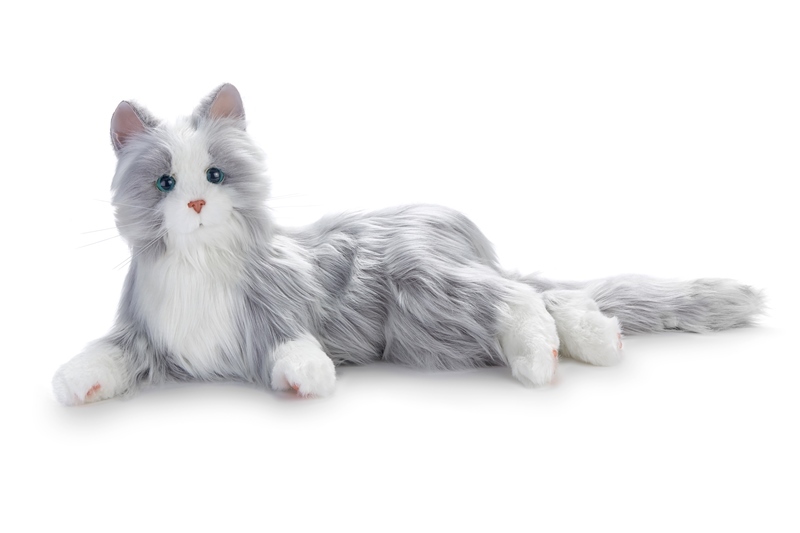 Caregivers will find this gray cat helps bring delight, joy, and companionship into the life of an elderly loved one. 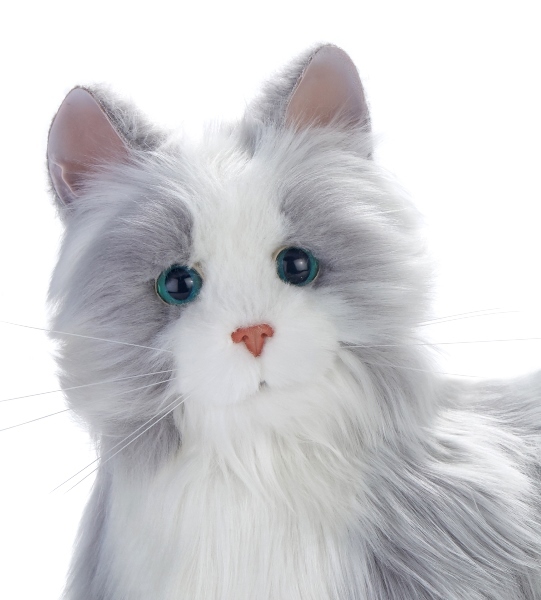 Joy For All Silver Companion Cat has technology that enhances its life-like qualities so that it looks, moves and feels like a real cat. The patent pending VibraPurr sounds and feels like real purring when the cat is petted on it's back or behind its head. The cat nuzzles its head when it's left cheek is petted. The cat will roll on its back with continued petting. The more it is petted, the more relaxed it will get, and it may even close its eyes and snooze. If the cat is not touched for a few minutes, it will go to sleep. To wake it up, simply gently pet it on the back. The cat may also wake up when movement is detected nearby. 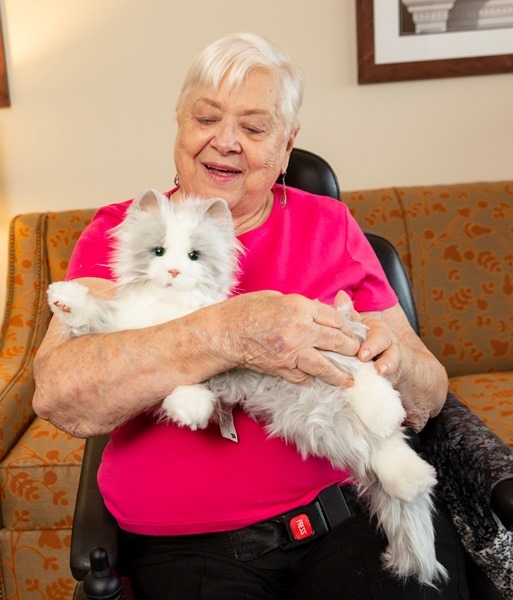 The Joy For All Silver Companion Cat provides a personally rich experience that can bring fun, joy, and friendship to elderly loved ones. Color: Silver with White Mitts. Power: Four 1.5V C Alkaline batteries, included. Dimensions: 15 inches long, 9 inches high, 10 inches wide. This is an excellent companion for anyone with dementia. The assisted living home my mom recently moved into had three of them and they were in very high demand. I ordered this one for my mom immediately so she could have her own. She had a dog to nurture at my home but sadly he was too old to take with her. I never thought she could be compensated with a stuffed toy. Her response to this tabby cat was amazing. I bought a baby sling so she could carry her cat with her. I also bought other accessories for it so my mom would feel like she was taking care of it. Dementia is such a sad disease but these types of things make our job, as caregivers, a little easier. My 90 year old Mom LOVES this cat!! It makes her happy and puts a smile on her face. She knows it's not real, but loves it for the companionship it provides her. She has named her kittie Daisy. Thanks for creating so,etching that provides the elderly with so much joy! I an Activity Director at a CCRC in Iowa and purchased this cat upon the recommendation of a speech therapist who has seen this item successfully utilized in another facility. It was a HUGE success! So very well received by our residents with dementia and without. 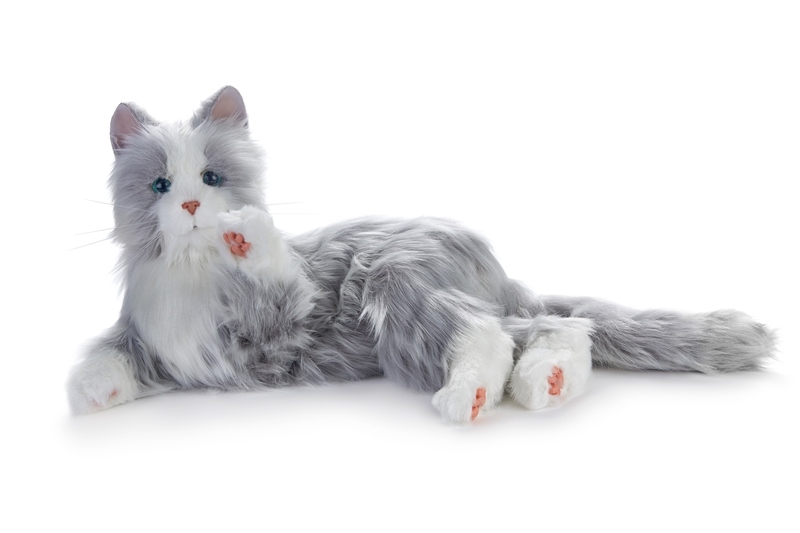 It seems that since the cat is so very interactive, people stop thinking about it as a "toy" even if they realize it is and begin treating and talking to it as if it alive. The sheer joy and response I have seen from some residents would have made the cost worth if it we had only it in our facility one day. We also have the dog which has been equally successful. I highly recommend more facilities make this purchase. We will be adding this item to our "Christmas List" for those people who want to make a gift donation to the facility at holiday time. Add it to your list as well. It can be used for "pet visits". When we get more, I intend to start a list for "pet care". Residents can sign up to "care" for the pet for a day, 1/2 a day, etc. Very excited about the possibilities and very grateful for the recommendation. We purchased this cat for our 5 year old son because he wanted a CAT for Christmas. He has been talking about a cat for months and we were heart broken to let him know that we cant have a cat since my husband is highly allergic. I saw the Companion Cat on our Local News station in Chicago a week before Christmas, and I ran down to my computer as fast as I could to order it. This is the BEST alternative to a real cat. My son LOVES it and we do too! I cant believe it was only $99.00. Great price for all that it does! We are extremely happy with it and our friends are even amazed by it. Thank you Hasbro for manufacturing this product!!! Q: What are the functions of this toy? 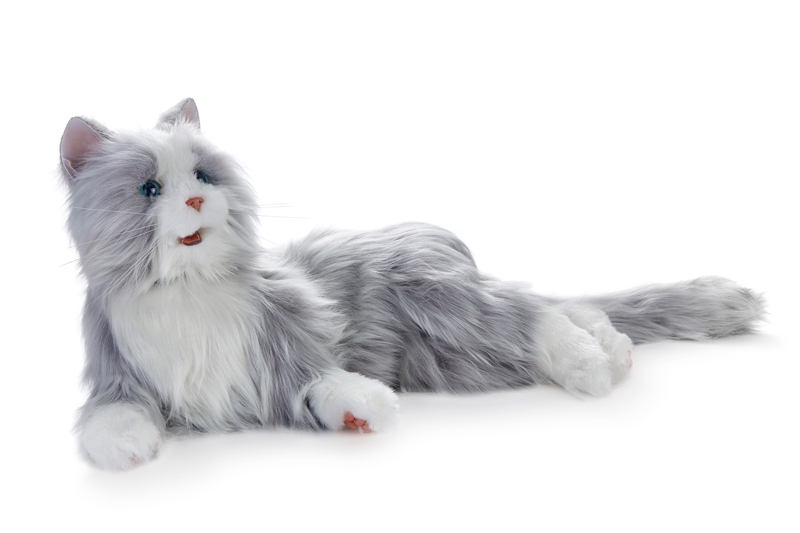 A: Hasbro's Joy For All Companion Cats have technology that enhances their life-like qualities so that they look, move and feel like a real cat. If their cheek is touched sensors detect it and the cat will lean in to be pet. Belly rubs are detected and the cat will roll over, the more you rub the more relaxed the cat will get. These are a couple of examples of the cat's functions. Q: Does this cat meow? A: Yes, the Companion Cat purrs and meows. A: There are light sensors on the cat's head so if it detects and light changes it will respond. There is a mute function on the Companion Cats that can be turned on if the tv causes too much of a response for the cat. It will still move and purr, just without a sound. Q: This cat is to be given to my small granddaughter. I would like to know what kind of stuffing is used in the cat, if its natural and healthy for a small child to have and breathe. Where is it made? What kind of hair material is used?Thank you for answering honestly these questions to a worried grandmother. A: The hair and filling are all artificial polyester fibers. It is safe to breathe in and will not interfere with any medical devices. The Hasbro Joy for All Companion Cats are made in China. Q: What movements does this cat do? Does the back legs move also? A: There is a short video at the end of the pictures. This shows several functions of the Companion Cat. The back legs have limited mobility. The cat will roll over on it's back for belly rubs also. A: Please call Customer Service at 877.750.0376. A representative will be more than happy to help resolve this issue for you and your parent.